 Relationships: Studied under Charles Gleyre. 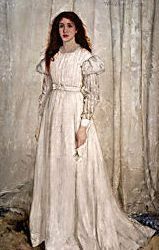 Whistler's students included Gwen John, Walter Greaves, Mortimer Menpes, Lawton Parker, David Ericson and Harper Pennington. Paint should not be applied thick, it should be like a breath on the surface of a pane of glass. Collection of hundreds of works by Whistler. Click "Search the Online Catalogue" and search by titles, artwork medium, or other keyword. James McNeill Whistler at the Smithsonian American Art Museum, Washington D.C.
James McNeill Whistler at the Smithsonian Sackler-Freer Gallery, Washington D.C.
Undocumented feature: Click here to see the image at a much higher resolution. Info about a 2007-08 exhibition: "The Gentle Art: Friends and Strangers in Whistler's Prints"
James McNeill Whistler at the Smithsonian Archives of American Art, Washington D.C.
Online guide to Whistler's "Peacock Room"
Bing Images: "James McNeill Whistler"
"James Abbott McNeill Whistler Etchings & Drypoints"
All images and text on this James McNeill Whistler page are copyright 1999-2015 by John Malyon/Specifica, Inc., unless otherwise noted. Note that the listings on this site are a unique compilation of information and are protected by copyright worldwide.